Korea exacted a measure of revenge Wednesday when Korea’s An Choyeong defeated China’s Gu Li by a half point in the second round of the 15th LG Cup. 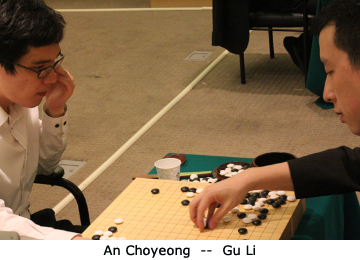 Gu Li had defeated Lee Sedol in the first round, eliminating Korea’s strongest player in this tournament. Lee Changho, who defeated China’s Tuo Jiaxi by resignation, is now Korea’s leading hope in winning this year’s LG Cup. Choi Cheolhan is also a strong contender for Korea and is currently playing extremely well. 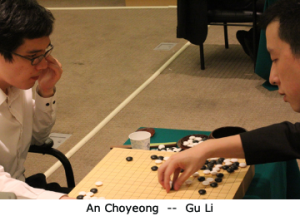 In a rather surprising outcome, China’s Hu Yaoyu defeated fellow teammate Chang Hao by resignation. Of course, China’s Kong Jie is the defending title-holder and the favorite to win the LG Cup for a second year in a row. He defeated Korea’s Mok Jinseok by resignation and will face his fellow teammate Hu Yaoyu in the third round, which will be played on November 8th.